Starting your own directory or membership website can be overwhelming. There are tons of platforms, themes, templates and plugins to choose from. How are you supposed to know which option will work best for you? In this article we’ll try to help steer you in the right direction by giving you a TemplateMonster review and a Templatic review. There are turn-key solutions, such as Brilliant Directories. There are scripts that you can re-code and customize to fit your directory website’s needs. And then there are the thousands of free and paid WordPress directory themes. Though not necessarily popular for directory websites, WordPress is without a doubt the most popular platform for building a typical website. If you’re already hooked on WordPress and comfortable with managing your own hosting, security and updates… then there’s a whole universe of free and paid themes to take advantage of. Included in those options are TemplateMonster and Templatic – two of the more premium options in the WordPress universe for website directory themes. TemplateMonster has thousands of themes to choose from, while Templatic has over 90 proprietary themes. Let’s start by covering the basics of the WordPress themes provided by TemplateMonster and Templatic, and then we’ll touch on the benefits of all-in-one directory website solutions like Brilliant Directories. Which theme provider is the best? What about an all-in-one solution? TemplateMonster is one of the oldest and most well-known website template providers. They opened up shop about 15 years ago and started with a typical design studio that had a relatively small crew. Then, at the beginning of the 2000’s TemplateMonster introduced their first ready-to-use themes. Over a decade ago TemplateMonster only had three kinds of templates to offer. Now TemplateMonster is one of the leading companies that provides services related to website construction and they now have a gallery of over 26,640 premium themes. What is more, these are not all of the products that TemplateMonster has to offer. Put briefly, TemplateMonster sells all kinds of website templates. Visiting their portfolio, you will also see many free themes. There are assets, extensions, and plugins as well. Additionally, the company helps their users with template installation, any required customization, logo implementation and more. Plus, in 2017 TemplateMonster became a full-fledged digital marketplace. With that, developers can become partners with TemplateMonster to sell their digital products worldwide. Best of all, TemplateMonster has products that work with virtually all website platforms such as WordPress, Shopify, and more. We chose to use the Monstroid WordPress theme as an example of TemplateMonster’s products. All themes come with regular updates – Monstroid was actually updated with an entirely new second version of the theme – Monstroid 2. What do you get when choosing this theme? Before all else, keep in mind that each and every template from TemplateMonster is mobile-responsive, cross-browser compatible, and SEO-ready. Therefore, even the cheapest theme contains must-have features. Secondly, every TemplateMonster template comes with a set of ready-made sample pages. They are pre-designed and contain a well-commented code should you need to customize any of the code. Lastly, all the themes have a versatile and fully customizable design. All theme components (from fonts to layouts) are flexible; you can edit them with ease and transform your theme to best support your online goals. There are plenty of other benefits you get when using a theme from TemplateMonster. Now let’s take a look at the Monstroid 2 package which costs $68. Being multipurpose, this template contains 9 design sets to choose from. You’re able to build almost as many sites as you want with this theme, given its versatility. Thus, inside this premium product, you will find the templates for hotel, furniture, fashion, sports, and shop related websites. All of these sets come with different overall designs schemes to better fit the intended business type. Monstroid 2 provides different headers, footers, web fonts, and icons to choose from. As expected, everything is pre-designed, so all you need to do is choose which elements you want to use. The same concept applies to the blog layouts and gallery styles. Monstroid offers masonry, grid, listing, and justified layout options for a blog. This professional theme gives you a large variety of widgets and plugins to use on your website. Some of the plugins include MegaMenu, Cherry Projects, Cherry Search and Socialize, WooCommerce package, Appointment Booking, PowerBuilder and more. Installing Monstroid 2 is hassle-free with the use of the built-in Cherry Theme Wizard. Monstroid 2 is updated regularly with new features and security protocols. There is a brand-new Jetimpex Dashboard plugin to assist with the theme’s updates and backups. Lastly, there is a GPL3 license, Google Analytics, RTL languages support, and a suite of other valuable functions included with Monstroid 2. Finally, let’s take a look at the fast, free and friendly technical support that TemplateMonster provides. They are available 24/7 via phone, email, chat and support tickets. A fantastic benefit with TemplateMonster is that they provide lifetime support. Even if your last purchase from TemplateMonster was several years ago, you will not need to buy anything else to get help with your site. Templatic is another popular website template and theme provider that’s been on the scene for almost a decade. Thousands of popular online projects have been created with the help of Templatic’s themes. Needless to say, all of their products are ready-to-use and user-friendly. Unlike TemplateMonster, Templatic only sells WordPress themes. Undeniably, WordPress is the most popular content management system (CMS). Therefore, Templatic’s services are marketed to a very large and continuously growing audience. Unfortunately, this means they don’t provide themes for other popular website building platforms such as Joomla, MotoCMS, Magento, etc. Currently, Templatic has almost 100 premium WordPress themes to choose from and their collection includes more than 50 plugins. All of their products are high-quality, so website admins can power and monetize their projects with ease. The next thing you should certainly know about is Templatic’s club membership option. Paying $299 per year, you get full access to all of their templates with which you can build an unlimited number of websites using the themes’ licenses. 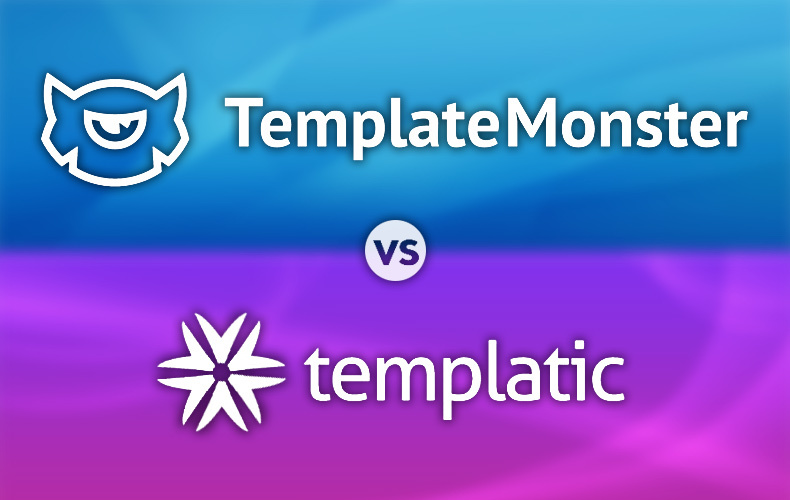 Similar to the multi-license templates from TemplateMonster, Templatic’s membership is a ready-made solution for website developers – choose your favorite templates, edit them and sell! StoreBox is marketed as the best eCommerce theme from Templatic, so we’ll use this theme as an example. Its price is $59 and is packed with features. 10 homepages to design your website. Includes trendy eCommerce features like quick product view and star ratings. Ajax product category filtering to sort content. Includes a variety of layouts, headers, fonts and footers. There are also some mobile headers with several layouts. Multiple blog styles including classic and contemporary layouts. Working with Templatic, you can get technical support via private tickets. Moreover, you can visit their forum or check their extensive posts, videos and tutorials. The website templates available from TemplateMonster and Templatic are clearly worthy of consideration. However, TemplateMonster does have a much larger selection of themes to choose from and their tech support tends to respond quicker and is slightly more accessible than Templatic’s. The only caveat is that when using WordPress you will still need to manage your own hosting, install the required plugins for proper website functionality, ensure updates of your theme and plugins are stable and won’t break anything, as well as manage the security of your website. This can all be a lot to handle. Most themes provided by TemplateMonster, and all themes provided by Templatic, do include a handful of additional third-plugins that you will need to install to properly power their directory themes. And those plugins will all need to be updated regularly in addition to the version of WordPress that you’re using. If you feel confident in this routine maintenance, then TemplateMonster or Templatic themes could be a great fit for you! These two theme providers have countless templates for you to choose from. 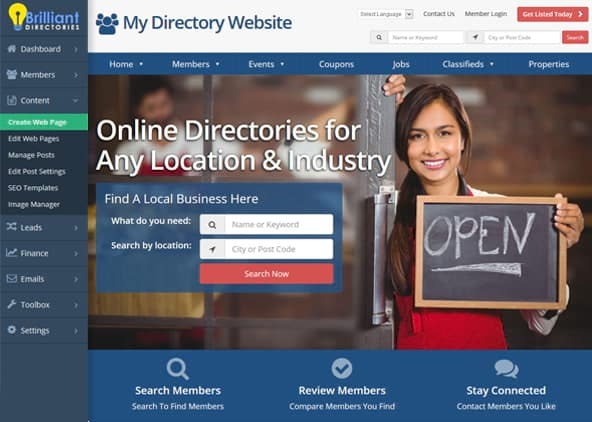 If you still want an awesome product that includes hosting and tech support at a value price, consider a turn-key, all-in-one solution such as the directory themes available from Brilliant Directories.